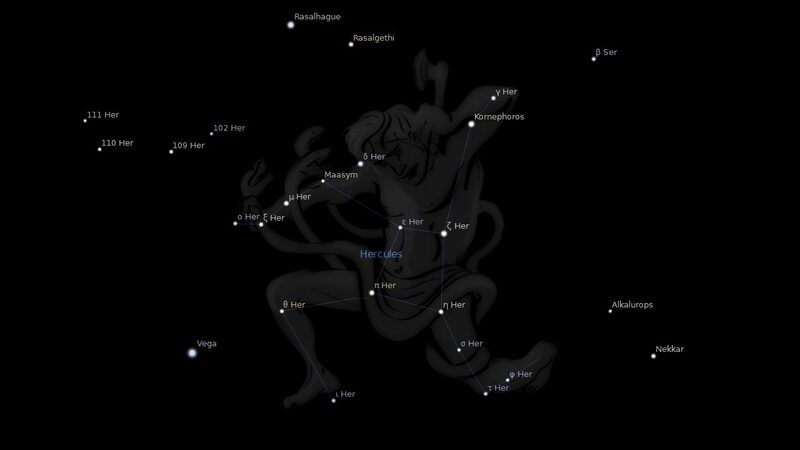 Constellation Hercules the Kneeling Man, is a northern constellation sitting above constellation Ophiuchus, with his foot on the head of the Dragon, constellation Draco, between constellation Bootes and constellation Lyra. Hercules spans 50 degrees of the Zodiac in the Signs of Scorpio, Sagittarius and Capricorn, and and contains 12 named stars. 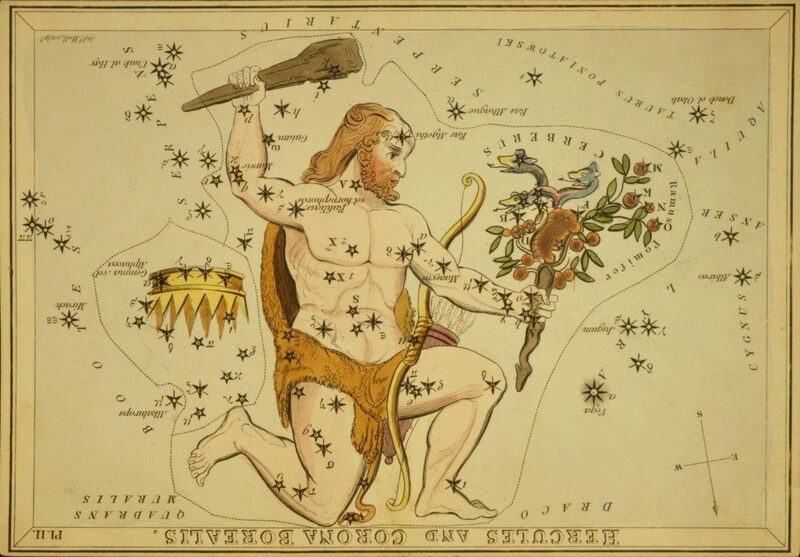 This constellation was put in heaven as a reminder of the labors of Hercules. According to another account, however, during the war between the Gods and Titans the former all ran to one side of the heavens, which would have fallen had not Atlas and Hercules supported it, and the latter was placed in the sky in commemoration of this service. Hercules stretching from just west of the head of Ophiuchus to Draco, its eastern border on the Milky Way, is one of the oldest sky figures, although not known to the first Greek astronomers under that name.. and some modern students of Euphratean mythology, associating the stars of Hercules and Draco with the sun-god Izhdubar and the dragon Tiamat, slain by him, think this Chaldaean myth the foundation of that of the classical Hercules and the Lernaean Hydra. Izhdubar is shown on a cylinder seal of 3000 to 3500 B.C., and described in that country’s records as resting upon one knee, with his foot upon the Dragon’s head, just as Aratos says of his Engonasi, and as we have it now. His well-known adventures are supposed to refer to the sun’s passage through the twelve zodiacal signs, appearing thus on tablets of the 7th century before Christ. This myth of several thousand years’ antiquity may have been adopted by Greece, and the solar hero changed into Hercules with his twelve familiar labors… while Ingenicla Imago and Ignota Facies appear in Manilius, — his familiar line, Nixa venit species genibus, sibi conscia causae, being liberally translated by Creech, Conscious of his shame, A constellation kneels without a name. In the Zodiac of Denderah we have a human figure, likewise with a club. His name is Bau, which means who cometh, and is evidently intended for Him who cometh to crush the serpent’s head, and “destroy the works of the devil.” In Arabic he is called Al Giscale, the strong one. 1. Fixed Stars and Constellations in Astrology, Vivian E. Robson, 1923, p.46-47. 2. Astronomica, Manilius, 1st century AD, p.353. 4. The Witness of the Stars, E. W. Bullinger, 11. Hercules (the Mighty One). What significance does Kornephorus have on Mays full Moon on Mars ? Good question Vicktoria. If I had a specific interpretation it would be more significant. For that full moon I looked to other stars in Scorpius which had individual interpretations. I am wary of even using Constellation descriptions for stars not commonly used in astrology. Why do two of the stars in this constellation have the same traditional name? Omega Herculis and Epsilon Herculis both have the traditional name “Kajam”, “Cujam”, or “Cajam” just with different spellings. BTW, the IAU has approved of the name “Cujam” for the star Omega Herculis.